Bimetal: Sincerity-oriented Bringing the most suitable products to customers - Zhejiang Bimetal Machinery Co.,Ltd. 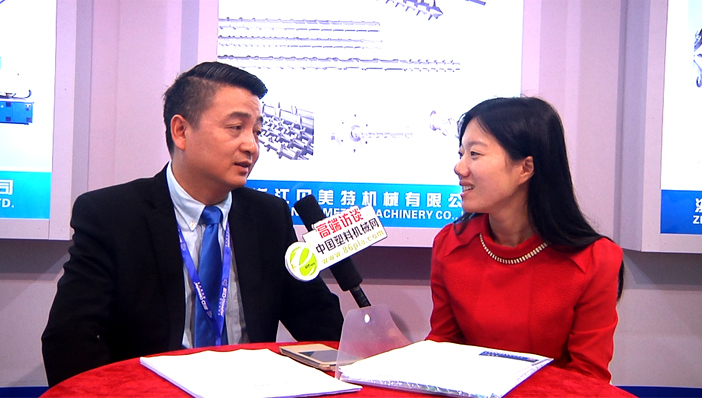 [China Plastics Machinery Network Interview] On April 25, 2016, the 30th China International Plastics and Rubber Industry Exhibition (CHINAPLAS 2016) was grandly opened at Shanghai New International Expo Center. Zhejiang Beimeite Machinery Co., Ltd. (hereinafter referred to as Beimei Te) brought several products to its debut. During the exhibition, Mr. Chen Wujun, Chairman of Bemidt, was interviewed by the reporter of China Plastics Machinery Network. He told about the development of Bemite and Mr. Chen. He gave a detailed introduction to the industry's perceptions, the company's challenges and the expectations of the show. Bimetal is a company specializing in the manufacture of series of screw and melt cartridge products. It has been established for more than 20 years. “In Zhoushan, there are as many as a few hundred companies that produce screws, and companies fight prices with each other. The quality of products with low prices must be affected. Disordered competition and vicious circles can only lead to the impediment of the development of one company. This is not the way I want to go. In this case, it is better to go out and develop foreign markets," said Chen Dong. "In 2005, I proposed the idea of 'survival at home and development at home'. Through these years of development, Bemidt has set a certain level abroad. Foundation, but this is still far from enough. We must continue our efforts." Speaking of the difference between Bemid and other companies, Chen Dong said: "The biggest difference is that we are trying to learn advanced foreign experience. It is precisely because we come into contact with customers from all levels of the world, especially mid-range users ( The mid-end user knows the product best. In the actual operation, he encounters good experience technology, we use it for it, and add its own elements. Through research and development, we try it slowly. When the customer is satisfied, we are also satisfied. At the time, this became our own wealth." The biggest challenge Beomeite faced came from himself. "Only winning is the best. Each company has its own characteristics, takes its own path to overcome itself, and puts quality and service first. This is the most important." For Bemid's positioning, "The most practical and most reasonable thing is the best, not expensive or best. Do business first. When the customer approves, feel that you are really considering for him, when the customer truly understands your sincerity. At that time, business was a matter of course," said Chen Dong. Speaking of the expectations of this exhibition, Chen Dong said: “The exhibition is a stage for displaying corporate culture and brand. With the increase in the number of exhibitors of the same type and the development of the network, the practical significance is not as great as before. We are the most important exhibitors. The purpose is to let the old customer agents feel relieved and let them know that Bemider is constantly developing. Participating is better than not participating, and the exhibitors still have a certain effect." Bimetal has always adhered to the tenet of “sincerity-oriented, quality-oriented, pioneering, and pursuing excellence”. High-quality products are the magic weapon for success. Integrity is the cornerstone of enterprise development. Bemid is constantly growing. In the future development, we believe that Bemid will move forward in a firmer and more orderly manner and will shine in a bigger market.